Located in the heart of Colorado all of Colorado Kayak Supply's staff are kayakers and take pride in helping you with your kayaking equipment needs. They can help you prepare for your adventure, whether it is your first whitewater kayaking trip or a sea kayak expedition to an exotic destination. ColoradoKayak.com offers the largest selection of whitewater kayaks, touring, and recreational kayaks, as well as kayak accessories, equipment and gear available anywhere. Visit 58Coupons.com often for the latest Colorado Kayak Supply deals, Colorado Kayak Supply promotions and Colorado Kayak Supply coupons for all your kayaking needs. Save 15% on accessories from ColoradoKayak.com when you purchase a kayak. Click link for code. 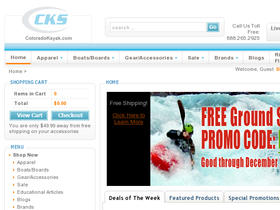 Head on over to Colorado Kayak Supply and enjoy free shipping on accessory orders of $50 or more. Find great savings of up to 75% on kayaking equipment and gear from ColoradoKayak.com. Click link now to shop. Click link for a selection of Kayaks and Boards offered from Colorado Kayak Supply at a savings of up to 30% or more. If you don't mind your equipment a little banged up (because let's face it, it'll get banged up anyway), then you can find savings of up to 20% on slightly worn gear from ColoradoKayak.com.